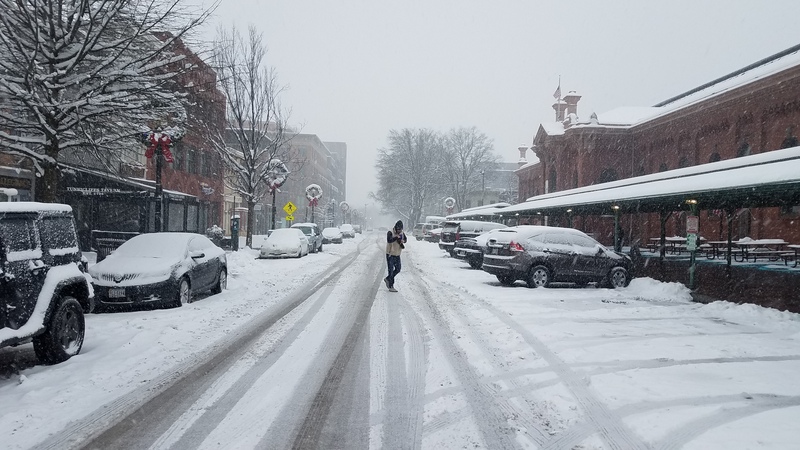 The 200 block of 7th Street, SE, looking south at circa 4:00pm today. CANCELLED. RFK Redevelopment – Community meeting with Events DC – today – RFK Stadium – 6:30 pm – 8:30 pm. Southeast Library Coffee & Conversation, 2:00pm, 403 7th Street, SE. ANC6B meets at 7:00pm, at Hill Center, 921 Pennsylvania Avenue, SE. Danny Boy LLC., d/b/a Little Pearl; 921 Pennsylvania Avenue, SE; Request to amend Settlement Agreement to change Sunday Hours of Operation, Sales, Service and Consumption within the interior of the Premises and Summer Garden to 7:00am. to 11:30pm. Current hours are 7:00am to 9:00 pm. 156 Duddington Place, SE; Special exception to construct a one-story rear addition to an existing, attached principal dwelling unit. Review of DDOT Notice of Intent on Establishment of “No Turn on Red” Restrictions at Selected Signalized Intersections. 628 A Street, SE; Historic Preservation application re concept/two-story rear and side, one-story rooftop addition. 302 South Carolina Ave. SE; Historic Preservation application re concept/rear addition. 121 7th Street, SE; Historic Preservation application re concept/three-story rear addition, one-story rooftop addition, alter front façade. 121 7th Street, SE; Special exceptions to construct a third story and rear addition to the existing, two-story, attached principal dwelling unit. Election of Officers and appointment of committee chairs. ANC 6A Alcoholic Beverage Licensing Committee meets at 7:00pm, Sherwood Recreation Center, 10th and G Streets, NE. Discussion of request for a change in hours for Dynamix Lounge at 1220 H Street, NE, (Retailer Class C Tavern license). ANC6A Economic Development and Zoning Committee is scheduled to meet at 7:00pm, Sherwood Recreation Center, Corner of 10th and G Streets, NE. 1511 – 1515 A Street NE – Zoning Adjustment application to subdivide existing lot and construct three new attached flats. 913 7th Street NE – Zoning Adjustment application to construct a two-story rear addition to an existing, attached principal dwelling unit. Sector 2 (PSAs 104, 107, 108) Community Meeting, 7:00pm. Location TBA. Happy Hour fundraiser for Coast Guard Mutual Assistance to help member of the US Coast Guard who are not receiving pay during the current government shutdown. Kenneth H. Nash Post #8 on Capitol Hill will be conducting a special happy hour fundraiser at its post at 224 D ST SE Washington DC 20003, from 5:30PM to 8PM on 17 January 2019. The fundraiser will be headlined by Nashville recording Artists ‘Wil Gravatt’ band (https://www.wilgravatt.com/). The cost of the event is $10. In addition, The Post will be conducting a 50/50 drawing and a silent auction. The Post has started a Go Fund Me Page for those who wish to separately donate (https://goo.gl/N4Unca). All proceeds from the event go to Coast Guard Mutual Assistance. RFK Redevelopment – Community meeting with Events DC – today – RFK Stadium – 6:30 pm – 8:30 pm.